The Growing Together Parent Handouts, available on the BC Council for Families website, were developed as part of the Province of BC’s “Healthy Minds, Healthy People – A 10 Year Plan to Address Mental Health and Substance Use in BC”. The workbook, comprised of seven “Everyday Opportunity” pamphlets, includes information on infant mental health promotion, education, screening, intervention and advocacy. It also includes parenting strategy handouts organized around everyday activities such as play, feeding and communication. “Getting enough sleep is important for your baby’s developing mind and body. Up to 30% of children can have sleep problems from time to time. You may also have trouble getting the sleep you need as a new mother or as the mother of a busy toddler. Many new mothers share stories of sleepless nights and exhaustion. 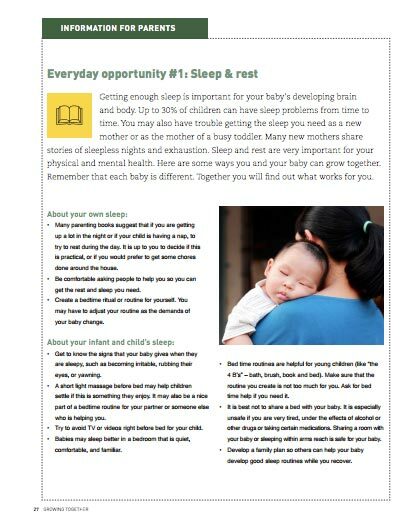 Sleep and rest are very important for your physical and mental health.” The pamphlet gives a number of suggestions to assist in promoting and establishing good sleep routines for mother and child. From Zero to Three: Love Learning and Routines talks about how routines help babies and toddlers learn self-management, and how they provide a sense of comfort and safety to young children. They bring parents and children closer together, guide positive behavior and safety, help develop children’s social skills, make transitions easier for children, and make parenting easier on parents. Developing and keeping routines can be harder to do if you have mental health challenges. The pamphlet talks about finding people you can trust who know your child well, who can help you give your child the time and attention they need, finding someone you trust to help develop a family plan about your children’s routines, and about allowing weeks or months to develop and establish routines. Supporting transitions. The pamphlet advises providing verbal clues that a change from one activity to another is about to take place, building transition times into your routines, and making sure that the methods you are using are age-appropriate for your child’s understanding. “Feeding is about more than nutrition. The connection you make with your baby during feeding times help you develop your relationship together.” The pamphlet stresses that every baby is different and you will need to find a feeding pattern that you are comfortable with, getting your doctor to review your medications for safety if you are planning to breastfeed. There are suggestions about taking a break from media (TV/cell phone, etc) during feeds, accepting the messiness that is part of empowering a toddler to learn to feed themselves, and encouraging young children to participate in meal time preparation. “Physical activity includes any activity where most of the body is moving. When babies are allowed to move and explore on their own, they learn about their environment and their abilities. Play is the child’s language and way of interacting with their world. Playing or taking your baby for a walk might be the last thing you feel like doing when you are not well. The medication you are taking might slow down your energy at certain times of the day. Try to be available to your baby physically and emotionally as you are able, even if it is for short amounts of time.” The pamphlet advises following the child’s lead, getting out of doors into the neighbourhood to meet other mothers and families, reading to your baby from infancy on, incorporating activities that involve nature to lower stress and improve wellbeing for you and for your baby, and not overwhelming your baby with too busy an environment or too many toys. “For babies and young children, touch and holding provide love and security. There are also benefits to the person providing the touch, such as lowering stress and anxiety and more confidence in parenting.” The pamphlet suggests ways of bringing touch into your childcare routines. It notes that babies vary in their needs, and some babies need to be held more than the parent might be able to manage, and require support from family or friends to share the load. Building in short breaks (re.g. a quick cup of tea on the couch while baby plays nearby) can help you stay well. The pamphlet stresses that touching or holding a baby a lot will not “spoil” them; touching and holding helps babies and toddlers grow and develop. Early language: As toddlers learn to talk, they are better able to share their thoughts and feelings. They begin to ask a lot of questions about the world, and exert their independence by saying no and not following instructions. The pamphlet offers a suggestions for promoting positive communication and dealing with your responses to the child’s behaviour and worries. “Having access to supports and resources can help you stay well. Friends, family and other experienced people can support you and help you meet the changing needs of your growing young child. You may be thinking about how to talk about your illness to your young child, and what to do if your illness keeps you from parenting full time. It is important to remember that young children are resilient and strong, and that you can grow together.” The pamphlet offers information on building a network of supports, and about coping strategies if you are not able to parent full time.